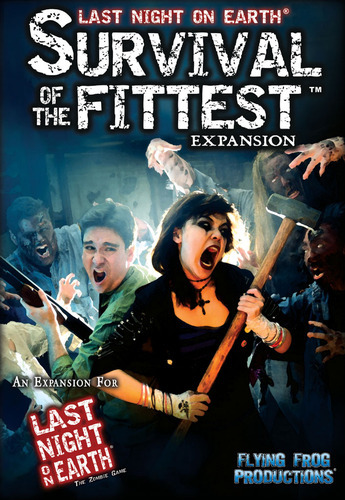 'Survival of the Fittest' includes three all new card decks for Last Night on Earth, as well as new game mechanics (such as Barricades and Sewers), and 4 new scenarios. Heroes can now find powerful Unique Items and Survival Tactics (The two new decks for the heroes). The Zombies are more ferocious than ever with the all new Grave Weapons deck. It also includes 4 counter sheets, and some new cards for the hero and zombie decks. Adds unique items to heroes as well as zombies. Zombie items can completely change the out come of a scenario, as well as make the zombie player(s) more interesting. Not every group will want to sup up their Last Night on Earth game to the limit... but some people understand. This expansion really adds a lot of fun and depth to the game, and we've enjoyed every minute of it!